Why is it that some businesses seem to attract new Clients so much easier? Without the benefit of reputation, referral or more clever ad, some businesses are able to attract their unfair portion of business. They have an “it” factor working for them. Show me one of these businesses and I’ll show you their “it”; they’ve put the Client-pulling power of Differentiation to work. Many businesses may think they’ve differentiated themselves but unless they’ve done it correctly, have likely done little more than add counter-productive distraction to their business. In this article, I’ll show you the “secret sauce” that gives the Strategy of Differentiation it’s mojo. Become magnetic. 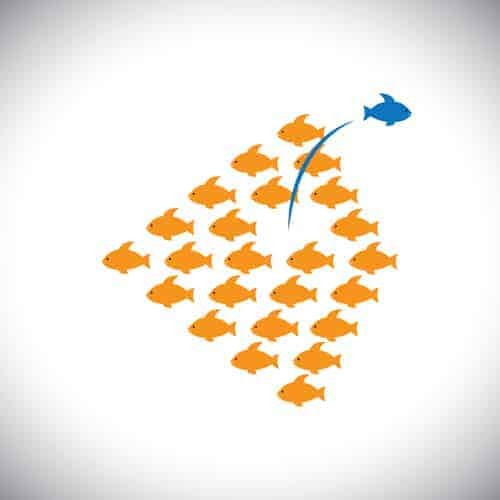 It’s like parting the competitor-filled sea so the right kinds of Clients and see you clearly and get to you easily. Stand out from the crowd of competitors. You can create your own category within the marketplace where there is essentially no competition. Attract a better Clientele. Engrained in your differentiation strategy is a conscious decision to appeal to a certain kind of Client. In fact, as you’ll read later, this is at the heart of how to go about differentiating yourself. Close sales faster. Because you’re appealing to a certain kind of Client, they will be more excited to do business with you and that translates into much less sales resistance and a faster sale. Be able to charge more. When you become the Professional of Choice, you’re not competiting on price any longer. Create a competitive barrier to entry. When you’re the first to claim that spot and claim it clearly, any competitor trying the same differentiation will be seen as an inferior “me too knock-off”. Being cute isn’t differentiation. Adding a goofy tag line to your business isn’t differentiation. Sure, it may make you “different” but–if it doesn’t repulse your Ideal Client–does little to nothing to help your business. I’ve been to many networking events where those who attend do a 30 second infomercial. It’s common to see the experienced “networkers” deliver slick infomercials that are catchy and often humorous…and totally ineffective. As I write this, I have several vague recollections of these infomercials but can’t really tell you specifically about any one of them. They may have been entertaining at the time and made me wish I could be as funny as they, but their impact was fleeting. Yes, they stood out. Yes, people respect and applaud their ability to entertain. Those are all good things. But they were missing one key ingredient. In fact, as helpful as it is to have the entertainment value, this key ingredient delivered in a flat, monotone voice would do much more to attract new business. That key ingredient is: meaning. To stand out in a way that matters—that gets your phone to ring—you need to stand out in a way that is meaningful to your chosen market. A great example of differentiation that is meaningful to a specific market is Little Caesars pizza. By no means do they have the “best” pizza, but they do have the best solution for a specific Customer and, as the world’s largest carry-out pizza chain, they seem to be very successful because of it. They offer pizza that’s “HOT-N-READY” during their core hours. No ordering ahead. No waiting. Simply show up and you can have one of a small selection of freshly made pizzas instantly and at a low price. It’s perfect for the mom who wants to come home with a quick supper that will be popular with when there’s no time to make anything. They’ve engineered their entire business around it. From the people waving the signs on the sidewalk during supper-hour, to their specifically selected menu to how their pizza-making operation is setup. Unique. You want to find a quality of your Ideal Client that is important to them and sets them apart from other Clients who you do not want to particularly do business with. Available. A competitor has not already differentiated around. Excites. You want to find a point of differentiation that you can really get behind, that excites you. Since this will become a bedrock of your marketing, it should be something that you can live with for the long-term. 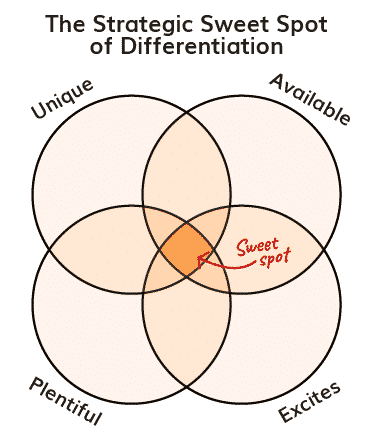 So You’ve Found Your Point of Differentiation…Now What? Once you’ve discovered your “it” factor–that point of differentiation that matters to your Ideal Client–it’s time to weave it throughout your entire company. This is the part where you work on your business and engineer your business into a Client-attracting magnet (I call them, of course, Piggybanks!). With differentiation in hand, you need to re-imagine every aspect of your business with it. From the messaging on your website to your networking infomercial to your brand. Your point of differentiation is a long-term, strategic decision that you engineer your business around. Yes, that might mean doing some dismantling work, throwing out that box of business cards and going through the bureaucracy and expense of a name change. But without the Client-attracting power of differentiation working for you, you’re going to have to work so much harder to get new Clients and will never quite breakthrough to success. By the way, with the Strategy of Differentiation working for you, you automatically 4X your reputation, the ease at which you get referrals and your ads will all be more clever. You’ll have the “it” factor working for you! Great article Scott! Love how you live it! I liked how you explained that just standing out to get recognised is not enough but in order to make it really matter and to reach an audience on a different level, it is necessary to stand out in a way that is meaningful to the targeted audience. Being unique in a way that makes an impact is the most important part, but also the most difficult to achieve. Thank you for providing examples, as well.